Info "Tap the end of the mechanical pencil! WASTE, WASTE, WASTE!" 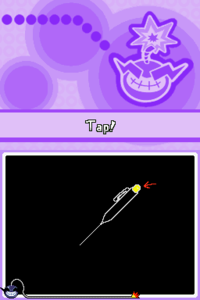 Waste with Haste is a microgame found in the Touch Training stage in WarioWare: Touched! The name comes from the term "haste makes waste". The objective of the game is to tap the blinking end of the mechanical pencil repeatedly until the lead falls out. If the player makes the lead fall before the time runs out, they win. However, if the time runs out and the player has not made the pencil's lead fall, they lose. 1st level difficulty: The player must tap seven times. 2nd level difficulty: The player must tap eleven times. 3rd level difficulty: The player must tap fifteen times. French Bonne Mine Pun on the word mine, meaning "lead", and bonne mine, meaning "good looks". This page was last edited on February 15, 2019, at 16:07.